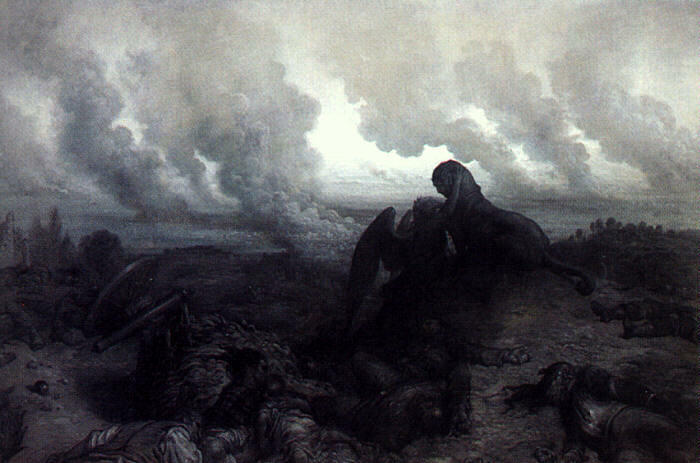 Image: The Enigma, 1871, by Gustave Dore Public domain. I love this one, Joy. It's been too long since I visited. The image of dust to wheat is especially powerful, and the refrain is so, so melancholy and so universal. There is a duality in the first three lines that leave me grateful and anxious--spring comes (and that's always good), but I can't stop thinking about the dead dog and bones... The anxiety is increased in the repetitions, as if the speaker can't find a fixed place or time to be in, no home. Spring has a face of death that we seldom remember... it used to be the time of starvation and pestilence, when food was scarce and light to bright. love the repeated refrain that make this into a song for me. poem that leaves me feeling slightly bereft...of what I'm not sure...the lack of home on the moon perhaps? Beautifully penned. the war drums are sounding, and some will only, finally hear them, too late. this has that sense of inevitability to it. which makes it superbly crafted... and chillingly prescient. Your talent is a gift, Joy. Such a gift may be a burden to the one who owns it, but it is a blessing for those who get to share in it vicariously. You have made this bleak prospect of season's change sing, albeit dirge-like, and the song sparks a brief hope, so human to rely on spring, change, growth in the face of war-talk and death. Each season comes to life through the death of another, and so well illustrated by your good self. Melancholy yet beautiful. Oh this is a perfect picture of how spring came too soon this year. There is so much to love in this. It is so heartbreaking to see things form buds and early blooms and then see winter visit for a day a freeze it into bleak. At first it seemed only nostalgic, but step by step became doom-laden, with that inevitability Shay remarks on.